Personalized Stainless Steel Car Mugs, Custom Printed in Bulk or Blank. Insulated, Promotional, Inexpensive. Budget Prices in the USA and Canada. Silver, 16 oz. Capacity. Bulk Personalized Stainless steel mugs are an ideal gift for car travelers. 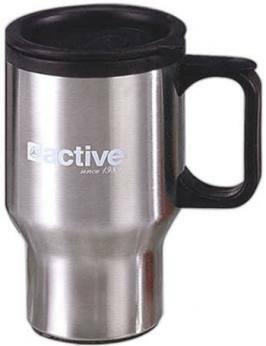 Our wholesale custom stainless steel car mugs may be used as insulated coffee mugs, but can just as well keep constant the temperature of any liquid, hot or cold. Budget Prices in USA and Canada for personalized stainless steel mugs. The are shaped to fit perfectly in the car mug holder. The outer wall of the personalized car mug is made of high quality brushed stainless steel, and the inner wall is made of black, temperature resistant plastic. We also supply blank (not imprinted) stainless steel car mugs at EQP (End Quantity Price). Free artwork design. We will send you a proof for your approval before production. American clients pay no taxes.